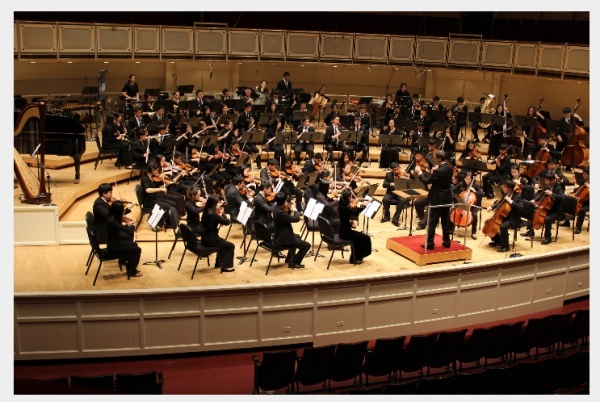 Spring break was an opportune time for The Harker School Orchestra, which traveled to Chicago to perform at the Chicago International Music Festival. Earlier this year, the orchestra was chosen to premiere a new piece by composer Jeremy Van Buskirk. The piece, titled “… such as I am you will be,” was one of three performed by the orchestra at the festival, along with Arturo Marquez’s “Danzon No. 2” and the fourth movement of “Symphony No. 5” by Dmitri Shostacovich. The orchestra’s performance won a Gold Award and high praise from Deborah Gibbs, president and CEO of World Projects, the production company behind the festival, who declared The Harker Orchestra was the best high school orchestra she had ever heard. Chris Florio, upper school music teacher and director of the orchestra, was similarly enthused. “We have been preparing all year long for this event and I could not be more proud of how our students performed,” he said.